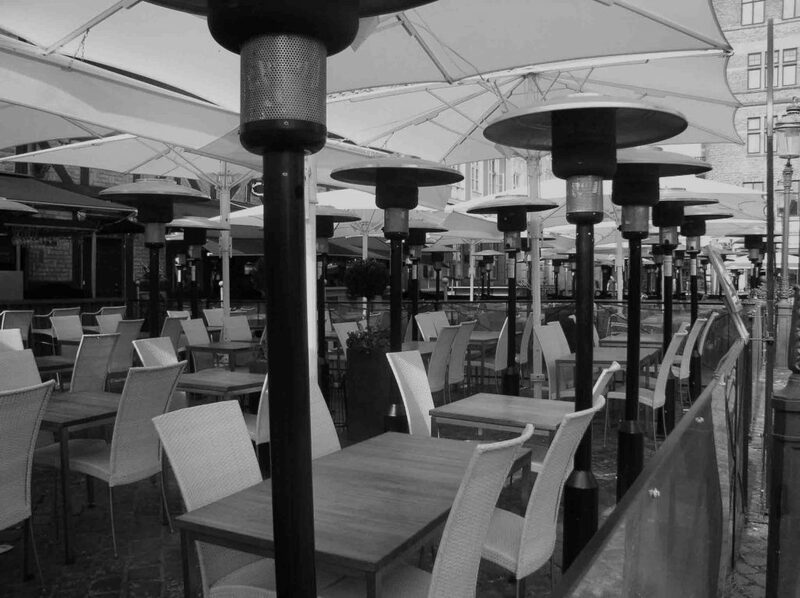 Patio heaters in Malmö, Sweden. Such a “production-based” calculation is not perfect, because countries with high energy use per capita often import a lot of manufactured goods from countries with lower energy use per capita. The energy used in the production of these goods is attributed to the exporting countries – meaning that the energy use per capita in the most ‘developed’ countries is an underestimation. Inequality not only concerns the quantity of energy, but also its quality. People in industrialised countries have access to a reliable, clean and (seemingly) endless supply of electricity and gas. On the other hand, two in every five people worldwide (3 billion people) rely on wood, charcoal or animal waste to cook their food, and 1.5 billion of them don’t have electric lighting. These fuels cause indoor air pollution, and can be time- and labour-intensive to obtain. If modern fuels are available in these countries, they’re often expensive and/or less reliable. It’s now widely acknowledged that these 3 billion people in the developing world are living in ‘energy poverty’. In 2011, the United Nations and the World Bank launched the Sustainable Energy for All (SE4ALL) initiative, which aims to “ensure universal access to modern energy services” by 2030. Bringing the rest of the world up to the living standards and energy use of rich countries would solve the problem of inequality, but it’s not compatible with the environmental problems we face. However, while it’s recognised that part of the global population is using not enough energy, there is not the same discussion of people who are using too much energy. Nevertheless, solving the tension between demand reduction and energy poverty can only happen if those who use ‘too much’ reduce their energy use. Bringing the rest of the world up to the living standards and energy use of rich countries – the implicit aim of ‘human development’ – would solve the problem of inequality, but it’s not compatible with the environmental problems we face. Some researchers have addressed energy decadence in a similar way, calculating a maximum acceptable standard of living. For example, the Swiss Federal Institute of Technology proposed the 2,000 watt society, which implies a worldwide energy use per capita of per 1,500 kgoe per year, while the Global Commons Institute’s Contraction and Convergence proposal limits energy use to 1,255 kgoe per person per year. 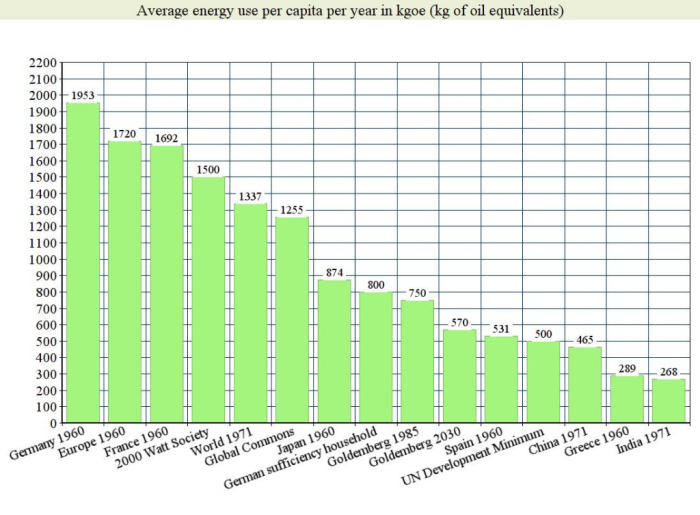 These levels of energy use per capita correspond to a reduction of 20-35% below the world average today. Between the upper boundary set by the carrying capacity of the planet, and a lower boundary set by decent levels of wellbeing for all lies a band of sustainable energy use, situated somewhere between energy poverty and energy decadence. These boundaries not only imply that the rich lower their energy use, but also that the poor don’t increase their energy use too much. However, there is no guarantee that the maximum levels are in fact higher than the minimum levels. To account for all these differences, most researchers approach the diagnosis of energy poverty by focusing on ‘energy services’, not on a particular level of energy use. People do not demand energy or fuel perse – what they need are the services that energy provides. For example, when it comes to lighting, people do not need a particular amount of energy but an adequate level of light depending on what they are doing. An example of this service-based approach is NGO Practical Action’s Total Energy Access (TEA) indicator, which was launched in 2010. The TEA measures households in developing countries against prescribed minimum services standards for lighting, cooking and water heating, space heating, space and food cooling, and information and communication services. For example, the minimum level for lighting in households is 300 lumens, and Practical Action provides similar standards for other energy services, not only in households but also in work environments and community buildings. Some energy poverty indicators go one step further still. They don’t specify energy services, but basic human needs or capabilities (depending on the theory). In these modes, basic needs or capabilities are considered to be universal, but the means to achieve them are considered geographically and culturally specific. The focus of these needs-based indicators is on measuring the conditions of human well-being, rather than on specifying the requirements for achieving these outcomes. Examples of human basic needs are clean water and nutrition, shelter, thermal comfort, a non-threatening environment, significant relationships, education and healthcare. However, the focus on energy services or basic needs also reveals a fundamental problem. If the goods and services necessary for a decent life free from poverty are seen not as universally applicable, but as relative to the prevailing standards and customs of a particular society, it becomes clear that such standards evolve over time as technology and customary ways of life change. Change over time, especially since the twentieth century, reveals an escalation in conventions and standards that result in increasing energy consumption. The ‘need satisfiers’ have become more and more energy-intensive, which has made meeting basic needs as problematic as fulfilling ‘wants’. 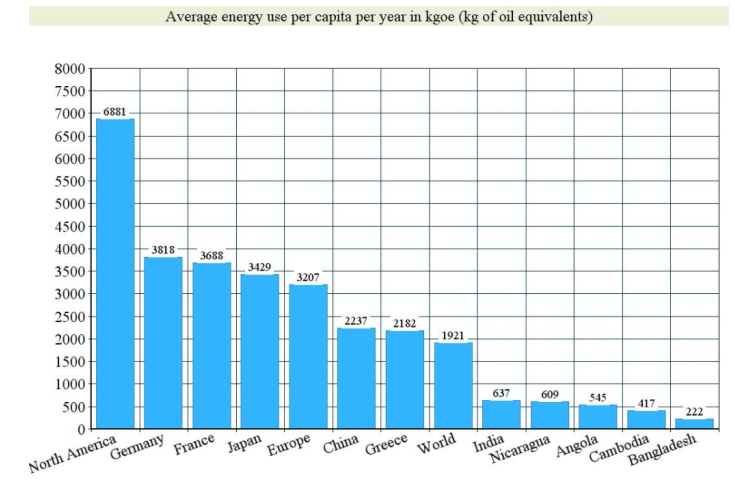 In fact, these days in the industrial world, even the energy poor are living above the carrying capacity of the planet. 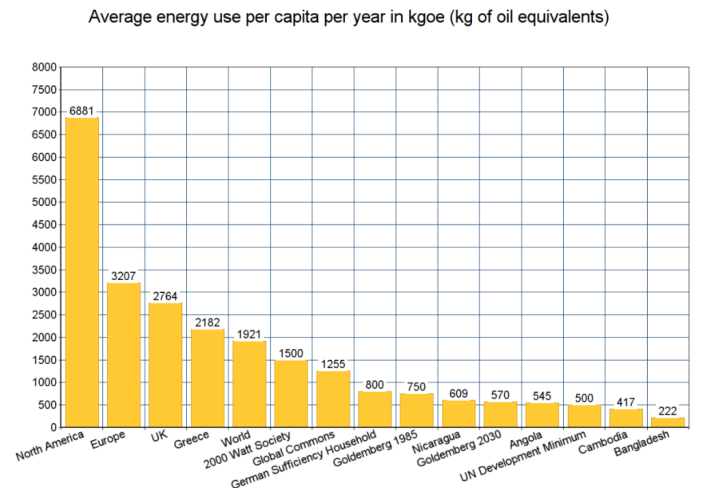 For example, if the entire UK population were to live according to the minimum energy budget that has been determined in workshops with members of the public, then (consumption-based) emissions per capita would only decrease from 11.8 to 7.3 tonnes per person, while the UN Development Program’s target to limit the increase in average world temperature is less than two tonnes of carbon per person per year. In short, the ‘floor’ is three times higher than the ‘ceiling’. Combining sufficiency with efficiency measures, German researchers calculated that the typical electricity use of a two-person household could be lowered by 75%, without reverting to drastic lifestyle changes such as washing clothes by hand or generating power with exercise machines. Although this only concerns a part of total energy demand, reducing electricity use in the household also leads to reductions in energy use for manufacturing and transportation.